History characterizes the essence of the Gran Hotel Montesol Ibiza, Curio Collection by Hilton, a historic hotel that has welcomed cosmopolitan travelers to the island of Ibiza since 1933. The Gran Hotel Montesol Ibiza was the first hotel on the island: an amazing distinction given Ibiza’s international reputation as a holiday destination. When the postwar era of the mid-twentieth century ushered in prosperity across Western Europe, Ibiza rapidly became the ideal vacationing spot for many Europeans. New forms of artistic expression emerged in Ibiza from this economic boom, transforming the island into a global cultural center for dance and music. As such, the Gran Hotel Montesol Ibiza hosted countless celebrities who were at the forefront of this cultural revolution. By the 1980s, Ibiza had become the premiere partying locale throughout the entire world. To this day, crowds flock to the Gran Hotel Montesol Ibiza to participate in the island’s legendary festivities. 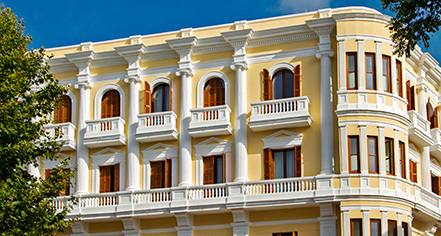 The colonial-style façade is an architectural icon in Ibiza, recognized by the Spanish government as a National Heritage Site of Cultural Interest. Upon crossing the threshold of the building, guests are immediately taken with its vibrant ambiance, wonderful décor, and exquisite service. The Gran Hotel Montesol Ibiza offers 33 beautifully renovated guestrooms and suites. Meant to complement the luxurious accommodations, the hotel provides world-class, Mediterranean-style cuisine at the Café Montesol, managed by the talented chefs at Grupo Sagardi. Guests can also host professional events or family weddings at the hotel, reserving space at the wonderful Rooftop Terrace or the luxurious Café Montesol. Gran Hotel Montesol Ibiza’s location on the main strip of the Paseo Vara de Rey makes the building a great place to start discovering the real city of Ibiza. Just a short distance from the hotel is the historic Dalt Vila neighborhood, a UNESCO World Heritage Site since 1999. Given the hotel’s proximity to downtown Ibiza, guests can easily participate in the well-known nightlife that significantly defines the modern culture of the island. Many popular beaches surround the Gran Montesol Ibiza, including the Aigües Blanques. Guests interested in learning more about the traditional customs of the island can sneak away to the small town of San Juan, and visit the rustic Craft Market, hosted every Sunday. Guests residing at the Gran Hotel Montesol Ibiza are at the best juncture to explore this exciting Mediterranean island and those nearby. Gran Hotel Montesol Ibiza, Curio Collection by Hilton, a member of Historic Hotels Worldwide since 2018, dates back to 1933. Many important cultural figures have stayed at the hotel, including Albert Camus, Orson Welles, Clifford Irving, Pink Floyd, Princess Caroline of Hannover, and Gina Lollobrigida. Accessible Rooms: An accessible room are available. Please notify request at time of booking. Adjoining Rooms: Adjoining rooms are not available. Early Check-In/Late Check-Out: Available on request, depending upon availability. Occupancy Restrictions: Maximum of 2 people per accommodation. Payment: Visa, MasterCard, Amex, Diner's Club and China Union Pay are accepted. Rollaways: Rollaways are not available. 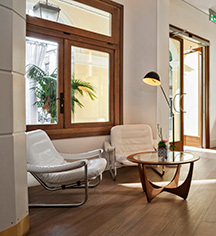 Learn more about the History of Gran Hotel Montesol Ibiza, Curio Collection by Hilton .